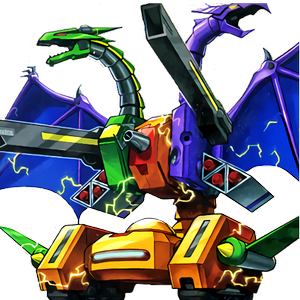 Borreload Savage Dragon is the Level 8 Synchro version of Borreload Dragon. Considering the impact both Borreload and Borrelsword Dragon have had on the game, one can say that these “Borrels” are nothing to overlook. With equal stats and level to the almighty Blue-Eyes White Dragon, 3000 ATK and 2500 DEF are big numbers to deal with. Its effect also allows it to pump its attack to even greater heights, creating greater potential for an OTK play. However, its stats aren’t what makes this card so good, but rather its effect. 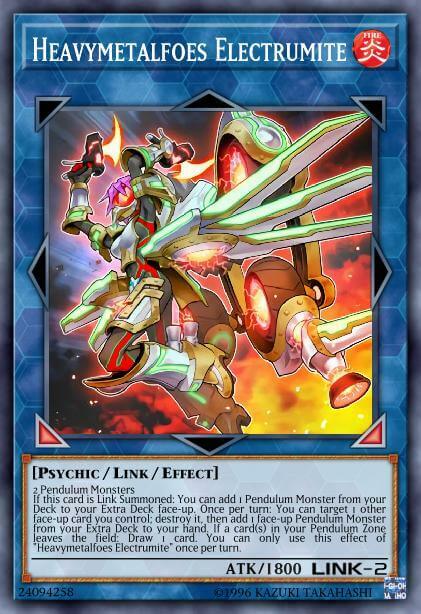 Upon its Synchro Summon, Borreload Savage Dragon can equip 1 Link Monster from the GY to it, giving Borrel Counters equal to that monster’s Link Rating. Then, as a Quick Effect, it can remove 1 Counter to negate the activation of an opponent’s card or effect. And if that isn’t enough, Savage Dragon also gains half the attack of the Link Monster equipped to it! Borreload Savage Dragon serves as another option for a negate when setting up a board. 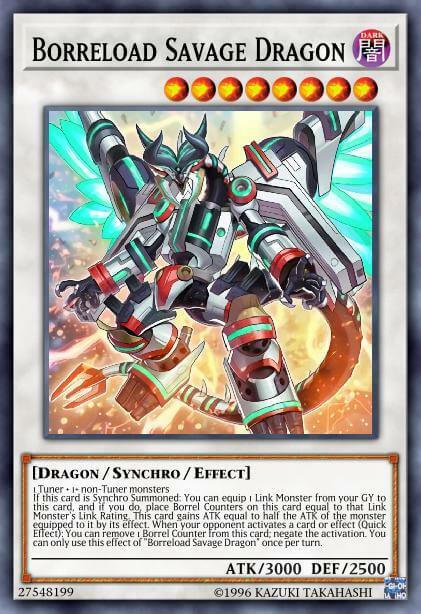 Requiring any Tuner and non-Tuner, it is generic and can negate the activation of any card or effect while providing a high attack body on the board. Also, whenever Crystron Needlefiber is released in the TCG, it becomes much more accessible for many decks. One deck right now that appreciates Savage Dragon is Pendulum Magicians. 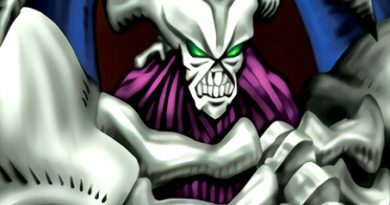 The deck typically Links off Heavymetalfoes Electrumite while leaving space for Harmonizing Magician to create Borreload Savage Dragon. This offers 2 (once per turn) negates and a 3900 body off a single monster! Of course, other strategies can find a use for Borreload Savage Dragon. Any deck that can Synchro and Link Summon, like Zombies, appreciates what Savage Dragon has to offer. Borreload Savage Dragon is a very solid card, but it also has its downsides. For one, its negation effect is only once per turn. Once the negation is baited out, it is a sitting beatstick for the rest of the turn. Second, although its effect negates activations, it does not destroy. This means monsters on the field will survive Savage Dragon’s negation. This means that the negated cards can still be used for board setups through link climbing. 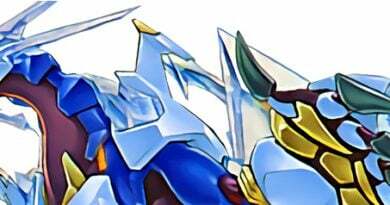 Although Borreload Savage Dragon is a generic Synchro, it requires a Link Monster in the GY for its full potential. 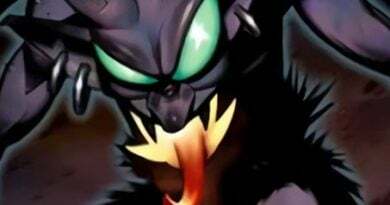 Therefore, not every deck can run it, and Savage Dragon will need setup prior to its summoning. It also loses much of its power to popular cards such as D.D. Crow and Called by the Grave. The cover card of Savage Strike is a powerful card, but is a bit specific when it comes to accessibility. It is not as accessible as Borreload and Borrelsword Dragon, but it does allow for turn 1 plays. He also requires less minimum materials than the others, making him a cheaper investment in the right deck. Be on the lookout for Borreload Savage Dragon in early February!